Ever since Jeremy Quentin, aka Small Houses, recorded his session for Onder Invloed two years ago, I’ve become a frequent listener of his music. Just about anything he’s released is very good. His voice is rather intoxicating and his songwriting is special and develops with every record. 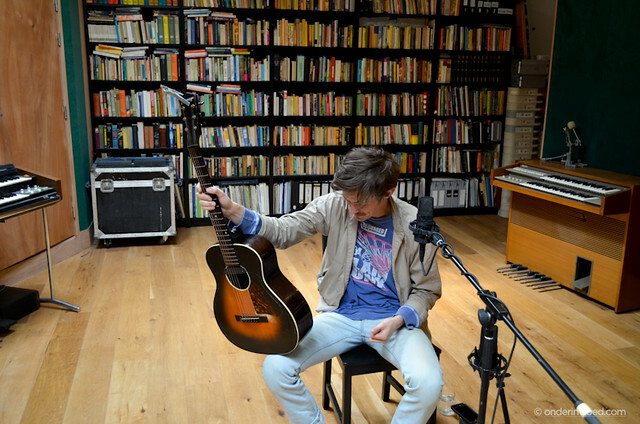 When he visited Utrecht earlier this Summer, we used the main room of the Mailmen studio to record a Wilco cover and one original. Turns out Quentin has a special place in his heart for Wilco, hence the annual tribute nights he organizes and the splendid article he wrote for Onder Invloed about the time he first discovered Yankee Hotel Foxtrot. Read the article and how to contribute to the new Small Houses record below the videos. ‘My love for Wilco started around the age of 15. I had taken the downtown bus from my suburban home just south of Flint, MI to meet a friend near our regular hangout, The Flint Local 432, a punk music venue on the main strip of downtown, a street that stretched about 7 blocks and consisted of a courthouse, a few empty offices buildings, a handful of bars, and the jailhouse. Subject to any typical midwestern town, my friends and I would be totally lost for things to do, so we’d get high, sit around the diner, walk through the neighborhoods and eventually end up at the bookstore. This was the place where I played a lot of my first shows as a high school drop out and acoustic musician, a Border’s Books on the west end of town with a small coffee shop and reading corner. The place was a megastore, selling a lot of the deluded Dan Brown novels or adult contemporary holiday albums that most likely kept the place in business for it’s short lived pre-digital existence. It was the Walmart of bookshops. Still, I was drawn back to the place by the scarcity of anything relevant to alternative culture in Flint. This was almost resolved by the small ‘staff picks’ selection along the back wall which included a few choice Sonic Youth CDs selected by a local rock band and Flint Local volunteers who all doubled as the store’s employees. All throughout the music section stood small vestibules with headphones hanging on their designated hooks or dangling and lying on the floor. The machine would let me pick from 5 or 10 predetermined albums while reading short, scripted and partially transparent band biographies which would individually become backlit when the corresponding album was selected by using a small keypad built into the body of the ikea-like woodgrain paneling. I remember finding out about a lot of albums that way. I fell in love with Jackson Browne, American Football, Bright Eyes, Marvin Gaye, Suicide Machines, etc. I learned the names of their hometowns and influences, both of which I was previously unaware. I was young, so I was naturally free of any preconceived ideas that I needed to listen and believe in one thing or another, having already decided, as a young attempted insurrectionist, that my parent’s would no longer have any part of my development. This ultimately meant, that by immersing myself into albums, I could be anyone I wanted to. I remember when Yankee Hotel Foxtrot was on display and enqueue by the store’s listening station. I loved the artwork immediately, it was so simple, unassuming, and totally opposite of everything I knew about art, which was almost nothing. It was a small two-tone print reminiscent of a woodblock or the black and white stencils of the Hindenburg which were spray painted by the skater kids on the back of a vert ramp behind the local high school. When I first started to listen, my thought was, ‘is this thing working?’. The CD machines were often broken, the headphone wires shredded on one side leaving only the left pan. All I could hear were unfocused but purposeful radio frequencies and mild static. It was the first seconds of I Am Trying To Break Your Heart, and this was the first time I heard noise music in this context. Eventually, after long moments of bewilderment and remembrances of something cinematic, the hook cut in and the familiarity of folk music came. There was this combination of the gentler side of a belated grunge and the accessibility of Paul Simon’s weirder moments under the production of Roy Halee. Everything was so intentional about this album, there was no toying around with filler features like long screaming guitar solos weaving in and out of the idea of a coda. There were no pleas for the chorus, a melody was established in a single attempt and with the certainty of their value, then expanded upon unforgivingly. This was a utilitarian’s approach to song, which is a wild idea given that the first track on the album is nearly 7 minutes long yet it still deserves the attention of the perfectly formulaic three minute and 40 second radio hit. I argued with the ability of the words, do these make too much sense or none at all. The lyrics didn’t subscribe to themes of unconditional love, in fact, they felt very conditional. There weren’t any contrived salutes to the standard folk and country living of rivers, mountains, or any other vague nature metaphor that ultimately meant nothing. That’s what confused me, I had never heard everything I knew about learned writing skills from novels and poems incorporated into song. I’m not saying that it was the first time it had ever happened in music, but it was the first in my life that I had noticed. Therefore, the demand of these words made the whole idea of songwriting, along with the hope to become one myself, a consistent lifelong effort instead of something that could be lived interspersedly and despondently by assuming the stereotypical persona of a rock musician. This was art without the inhibition of a contrived pop entity. This is where I began to stop identifying myself with other’s writing and started relating with my own. I had heard a lot music in my life up until that point, but never had I picked something for myself without the influence or suggestion of others and had it mean so much. There’s a cliche when talking about the first time we hear The Beatles. It’s as if, at the moment someone listens to a song like Helter Skelter or Sgt. Pepper’s, they start to care about music and decide that they would choose what they’d listen to as a lover of songs and not just someone digesting what was force fed to them by their peers or the overhead speakers of a grocery store pharmacy. Still, I never had that experience with a band like The Beatles, that was the music my parents listened to and something I had been around since before I can remember listening. Jeremy Quentin’s planning to head into the studio to record the next Small Houses record this Summer, and he needs our help to fund it. I’d suggest you head over to the special website to read all about it.